By Geoffrey Robinson, BWA teacher in the Eastern region. It was a hot July day in the summer of 18. My wife, Rachel, and I were catching up on yard work in our new house. We are both teachers and so each July begins the countdown to the first day of school. We had no idea our warm relaxing work day was about to come to an end. Parker and Hayden are our 2nd and 3rd children of 5. They were at work on this day; working for our family’s construction company. Parker was 16 and had been driving for about 6 months. Hayden was 14 and anxiously nearing the date she would take her permit test. Her excitement would be short-lived. Parker and Hayden decided to drive home for lunch about noon. Headed down a washboard filled gravel road, Parker began to test the boundaries of his first car. After all, what could possibly go wrong? He was feeling invincible. Parker’s Chevrolet Trailblazer started to “fishtail” and eventually lost control. His car swung violently sideways and rolled over twice. Hayden was partially thrown from the car and Parker was left unconscious in the driver’s seat. Minutes later, as Hayden began to gather herself, she made a frantic call to Rachel to tell us they had crashed and that she was out of the destroyed vehicle, but that her brother was trapped inside. She couldn’t be sure what the extent of their injuries were. I got out of my car and stopped to stare. I couldn’t hear the joyous voices of my two children. The surrounding forest was silent with no signs of life around. Time stood still. The next few seconds felt like eternity. Finally, I heard crying from back in the vegetation off the side of the road and could see movement through the trees. Hayden was holding her brother in her arms. She had helped pull her brother from the car. They were battered and bloodied, but alive. A feeling of relief set in as I saw them both struggle to stand on their on own two feet. I ran to them and held them both while they cried. Parker sobbed and said “I’m sorry, I’m so sorry,” over and over again. Rachel pulled in behind me and quickly helped Parker and Hayden into her car. She rushed them to the hospital. 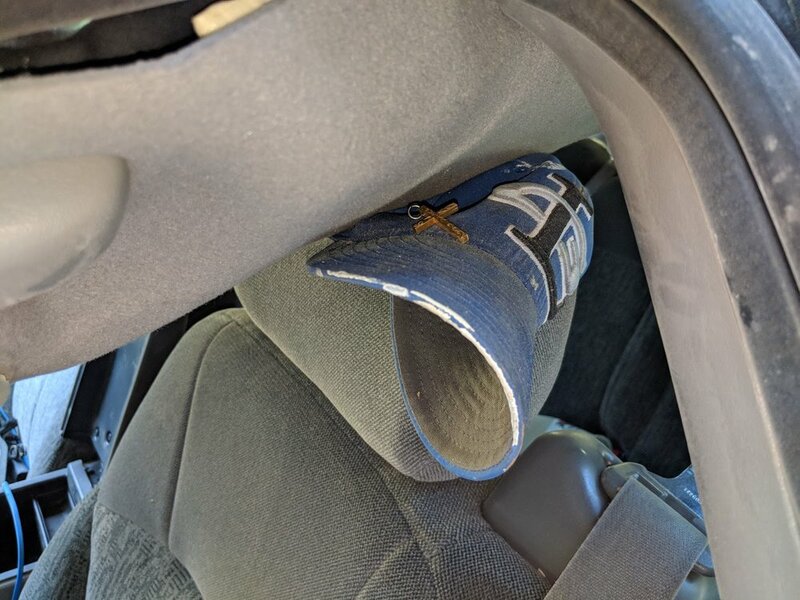 My son’s head had been smashed between the vehicle roof and the headrest, ripping his hat off his head as his head narrowly escaped being crushed. I tugged at my son’s hat while choked up and fighting back tears. I was so grateful that his head was no longer in that hat. I had been mostly emotionless to this point. All alone the Mt. Emily wilderness, I started to be overwhelmed by emotion. Once again, time stood still. Hours later, the vehicle was in the wrecking yard and it was time to love on my kids. I met them at the hospital where I was updated. Parker was fighting a concussion and some strained joints and ligaments. He was in a great deal of pain but he would make a full recovery. Hayden had a broken hand and would need surgery followed by almost a year of therapy. But ultimately, she will be OK.
Drive safe. No one is invincible. No one.